To become the caregiver for your parent is to tread on new ground. The parent, so used to dispense advice (whether requested or not) is now asking you for guidance – or perhaps is not even able to frame the question. For adult children who have never interacted with the long term care field, these new responsibilities can be overwhelming. If a parent has been hospitalized, the family may have only a few days to select a nursing home or arrange for support at home. If the adult children live far away or have demanding jobs, it can be extremely stressful to make these decisions on such short notice and to serve as the long-term caregiver. These are the kinds of situations where a geriatric case manager can make a big difference. 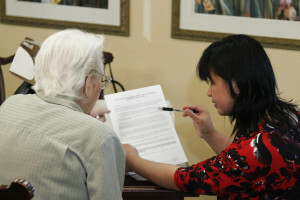 What Are Geriatric Case Managers? Organize moving a parent to live near an adult child in another part of the country. What to Look for in a Case Manager? You can hire a case manager for just an initial consult, or you can make the case manager an integral part of the on-going care plan. Have some sense of the degree of help you think you need before you meet with candidates. Identify the primary help your family needs. Are your parent’s needs mostly medical? If so, you probably want a case manager who is also a nurse. If you are looking to use community-based services, a social worker case manager may be the best fit. Is your parent open to help? If not, you may want the primary relationship to be between you and the manager. Most case managers charge by the hour, and the range is any where from $50 per hour to over $200 per hour. If you have budget constraints, have a frank discussion about whether the case manager can effectively serve you. You might also discuss whether other free or lower cost resources can meet some of your needs, thus narrowing the scope of the work for the case manager. The field of case management is rapidly growing, and there are people who claim to be case managers who have no training in assisting the elderly. Make sure that the person you are considering is certified by a national case manager organization, such as the National Association of Professional Geriatric Case Managers. Confirm the person’s underlying license as a social worker or nurse is current. If a case manager is going to be effective, you must have a good relationship with him or her. Someone can be highly credentialed and be recommended by good friends, and yet that person may not be a good fit for you. Dealing with an aging parent is stressful, and you should not compound that stress by hiring someone who does not put you at ease when you discuss your concerns. The importance of this dynamic depends on how you plan to use the case manager. If you want someone only to do an assessment or to recommend supervised settings, what your parent thinks of the manager is not paramount. However, if you want the case manager to take a hands on role, visiting your parent, going to medical appointments and the like, it is really important for your parent to like the case manager and consider that person as part of his or her team. It is not unusual for parents to resent anyone whom they think has taken over decision-making. Don’t despair if your parent is not enthusiastic from the start. Developing that relationship will take time. Incorporate the case manager into the apparent decision making gradually. A good case manager can make an important difference in managing the care of a parent, especially when the family members live far away or have other pressing responsibilities with children and work. Most families caring for elderly loved ones fare best with a team approach that spreads the responsibilities among different family members based on skill sets and availability. A case manager can be a great addition to the team. Previous Article: Who Will Decide for You, If You Can’t Decide Yourself?